You cannot see the castle from the main entrance. 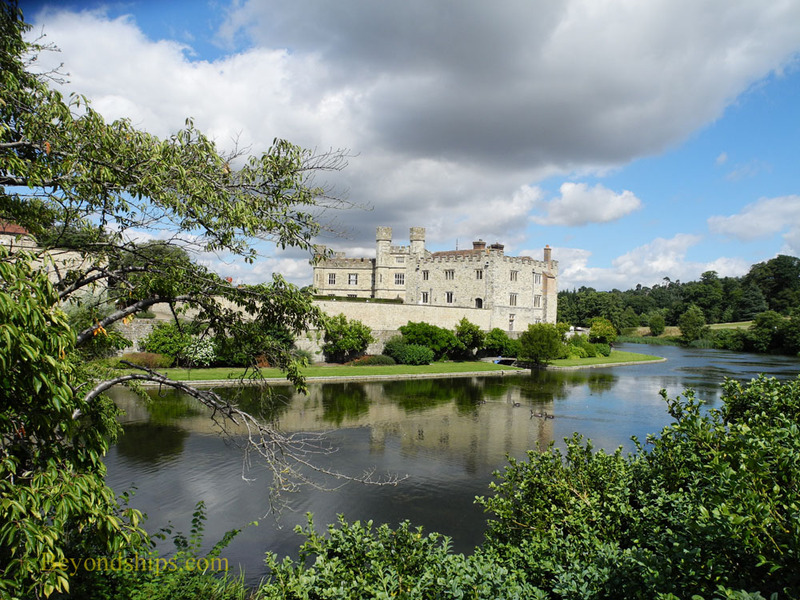 Consequently, the Leeds Castle experience really begins with a walk through the park. First, you walk through a wooded area beneath some tall trees. Then the vista opens out into an expanse populated with rolling fields, small rivers and lakes. These have been laid out so that different scenes unfold as you move along. Flowering plants border the paved path at places. All this has been meticulously maintained and on a sunny summer day are quite beautiful. On the far side of the park are some formal gardens. These too are quite pretty. However, the landscaped park, with its idealized presentation of nature, is an essential part of the British stately home. The concept become widely popular with the aristocracy in the 18th century and flourished under the influence of landscape architects such as Lancelot Capability Brown. As a result, you see one surrounding almost every surviving stately home. But the one at Leeds is a particularly nice example. The castle itself appears rising from a lake. Looking like something out of a fairy tale, the perfection of the setting might cause one to think that it sprung from the mind of some Hollywood set designer but in actuality, the lake was created for defensive purposes in medieval times. This is not to say that what you see today was what King Edward I saw in 1286 or even Henry VIII in 1520. During the 19th century, the aristocracy was captivated by a nostalgia for the days of chivalry, knights on chargers and fair ladies. Theirs was a highly romanticized view of the past rather than a desire to recreate the world that existed in the Middle Ages. As a result, many built mansions in a style that was reminiscent of that period while others redid buildings that dated from the Middle Ages to make them look more consistent with 19th century views of how medieval buildings should have looked. What you see at Leeds Castle falls into the latter category. ﻿Above: Scenes of the park. To enter the castle, you go across a bridge and through the gatehouse, which over the centuries has been used for various purposes. Today, it houses an exhibit on the history of the castle. On the other side of gatehouse is a grassy courtyard with a circular drive that leads up to the main house. Although it incorporates parts of preexisting buildings, it is known as the “New Castle” and was completed in 1823. Visitors do not enter the New Castle through the front door. Rather, you follow a path that takes you outside the castle's defensive walls and along side the lake to a basement door. 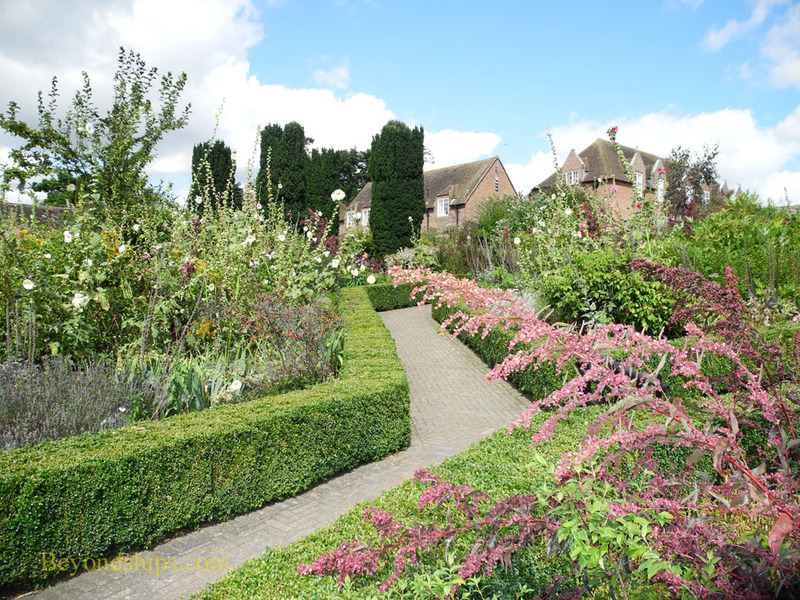 Flowering plants adorn the way and the views of the castle close up are impressive. Inside, the rooms depict different eras in the castle's history. Several relate to the castle's Tudor associations. Henry VIII is credited with transforming the castle from a fortress into a small palace and so there is a legitimate basis for this emphasis. Furthermore, inasmuch as Henry and his children have been the subject of several popular films and television shows, people are more familiar with their story than that of the early Norman royalty who were associated with the castle. The majority of the rooms have been left essentially the way they were when Lady Baillie, the last resident of the castle, lived here. Thus, they are not recreations but rather original presentations of history. Decorated by leading designers of the period between the two world wars, they were the scene of gatherings of the elite and the famous of that era. 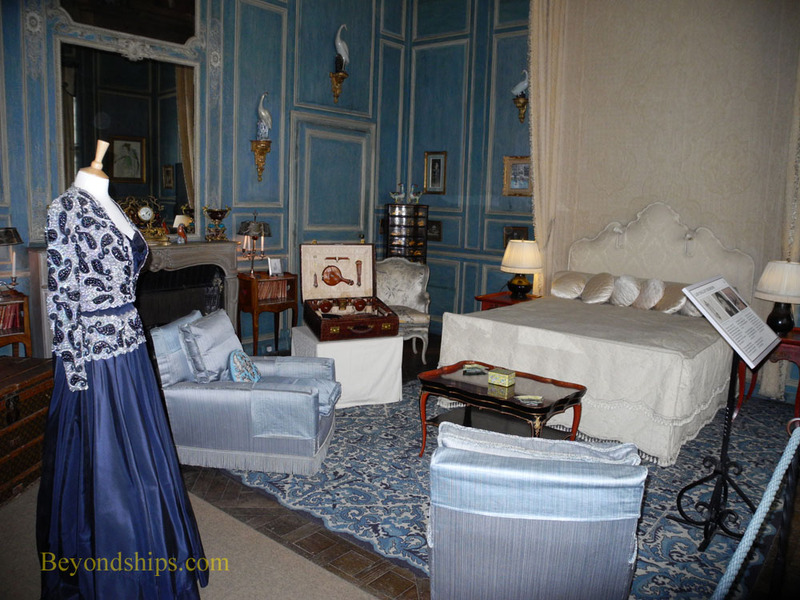 Leaving aside from their scholarly importance, such rooms were the real life inspiration for the world depicted in popular dramas such as Brideshead Revisited, Downton Abbey, and numerous British country house murder mysteries. Visitors can rent an audio guide to accompany them through the castle. However, there are also signs in the main rooms with information. Although visitors enter through the servants' entrance, they leave by the front door. But exploring the house and its grounds does not exhaust all the things that one can do at Leeds Castle. 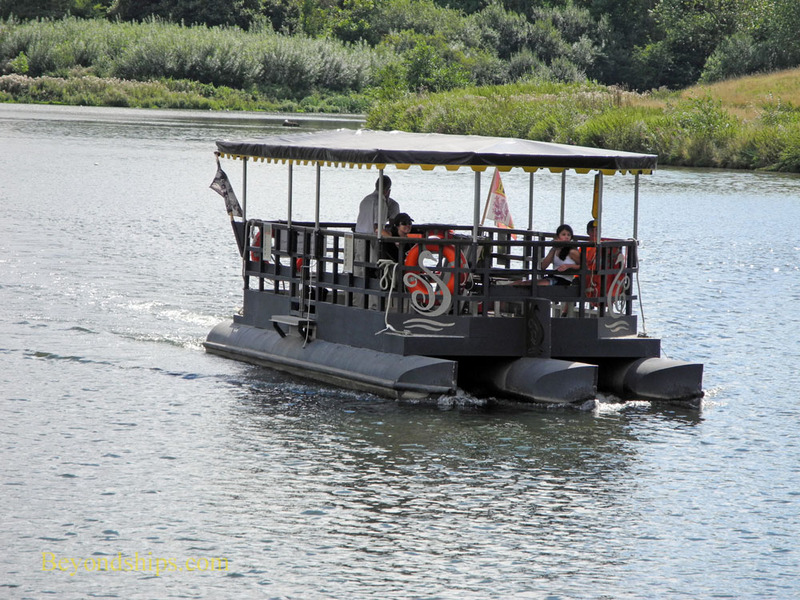 Visitors can ride on a punt in the lake surrounding the castle or go on an excursion boat on one of the other lakes in the park. A tractor train can take you around. There are displays of falconry and occasional events such as jousting competitions. 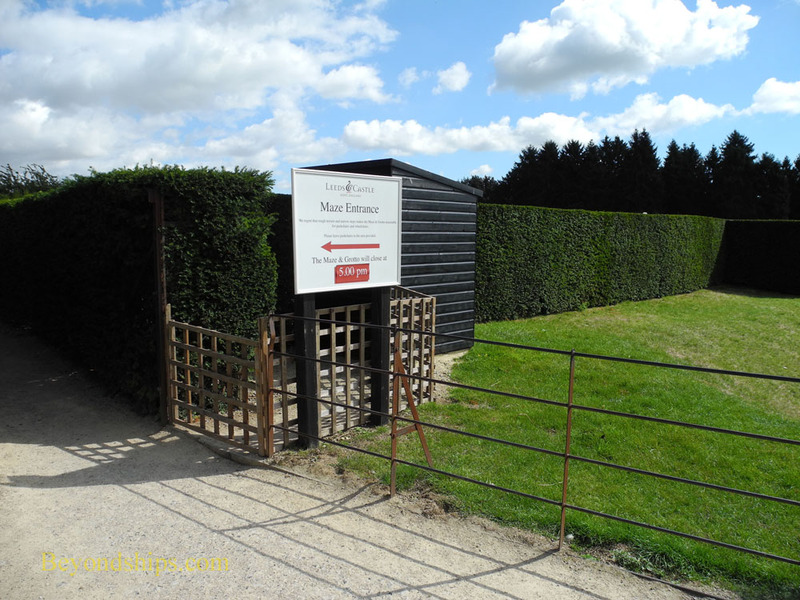 You can explore a maze made with 2,400 yew trees. For the younger set, there are various playgrounds. A golf course is on the estate. In addition, there are several restaurants and cafes on the grounds with different food offerings. Of course, these extra facilities and activities are not part of the original castle. But experience has demonstrated that some commercialization is necessary if a stately home is to survive. These are high maintenance properties and so additional revenue is needed. Furthermore, these facilities and activities expose these properties to a wider segment of the public, educating while entertaining. At Leeds Castle, the extras are presented with good taste. While they undoubtedly help to attract visitors, we did not find the number of people any more intrusive than at other popular venues. Moreover, there are some 500 acres to absorb them. ﻿Above: The entrance to the maze. 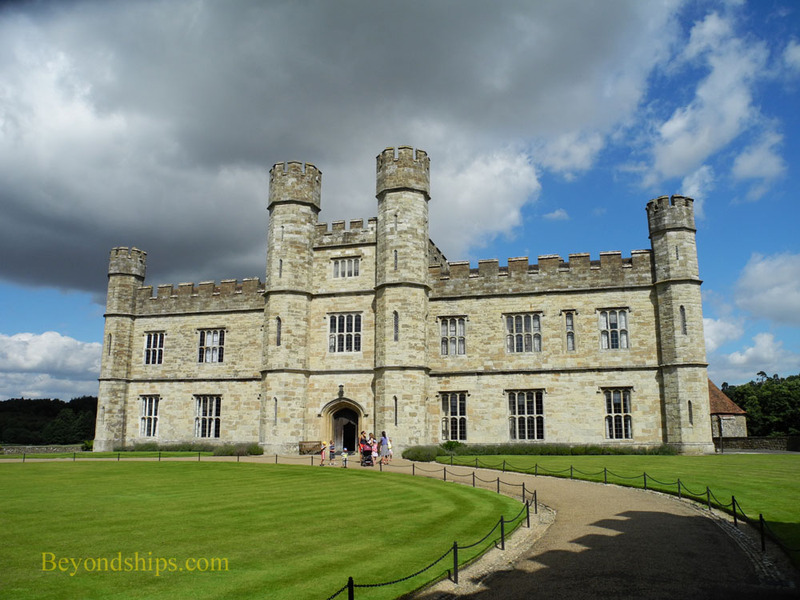 Leeds Castle is not in Leeds, which is a city in the north of England. 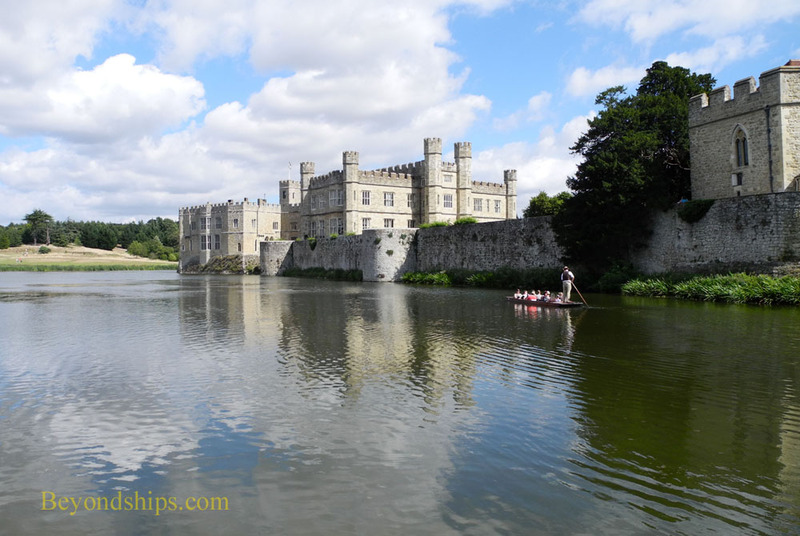 Rather, Leeds Castle is south east of London in Kent near Maidstone. The castle is close enough to London to be a convenient day trip. 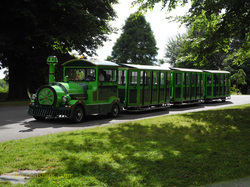 Several tour companies offer coach excursions. It is about half way between London and the Channel ports. Consequently, it can be visited on the way to or from cruises departing from Dover. 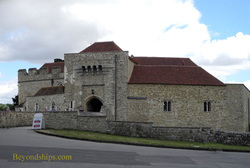 Some ships using Dover as a port of call offer shore excursions that include Leeds Castle. With the exception of Christmas and a few other days, the castle is open year-round. Admission tickets can be purchased at the castle or online.